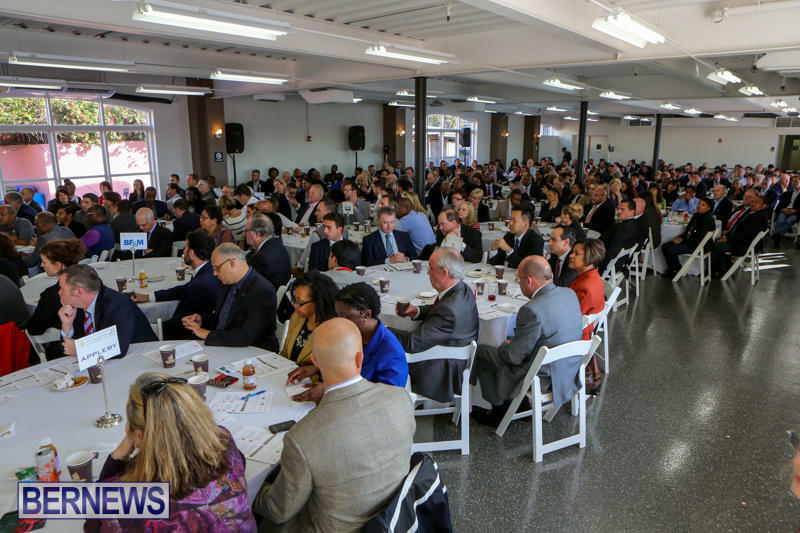 The Bermuda Chamber of Commerce hosted their Annual Budget Breakfast this morning [Feb 23] at Lower Pier Six, with the panelists included Minister of Finance Bob Richards, Nathan Kowalski of Anchor Investment Management, Kim White of Cox Hallett Wilkinson who also served on the SAGE Commission, while Arthur Wightman of PwC Bermuda served as moderator. The Breakfast follows after Minister Richards delivered the 2015/16 Budget on Friday [Feb 20], in which he said that gross public debt will stand at $2.185 billion as of March 21 2015; the borrowing requirement in 2015/16 estimated at $125 million; $170 million budgeted for debt service this year and the overall deficit is budgeted to be $220 million. The Minister also revealed that Airport Departure Tax will be raised from $35 to $50 per passenger, Duty on fuel will be raised by 5 cents per litre in April 2015, Payroll tax will be set at 14.5% in 2015/16, Corporate Service Tax Rate will be raised from 6% to 7%, and Payroll concessions in place for the hospitality, restaurant & retail sectors will be partially rolled back in 2014/15 with businesses in these sectors paying rate of 5.5%. Mr Wightman started the meeting off by saying, “The Minister made his case for the seriousness of our fiscal situation, describing the national debt as ‘the biggest risk to financial independence’, and outlining his determination to eliminate the deficit within three years. If the situation is as Grave as the Hon. minister stated please can someone explain to me why we all cant contribute by being taxed .5% of everyone working in Bermudas wage. I think this would be more of a shared sacrifice rather then just a few sacrificing their wage. Is this so that the unions can actually let their members vote about whether they want to explore some form of furlough option this time, or to let the leadership unilaterally decide just to waste everybodies time again. Because $200 is absolute peanuts as it is. Once upon a time, a long long time ago duty free was 100 pounds. That was when a pound was worth $2.40, but more important, most people did not even earn 50 pounds a week. In todays money duty free would be well over $1000.00 for returning travelers. Our duty free has been whittled away bit by bit till now there is nothing left to take from us. Because we don’t want to give anymore reason to the people who bring money into our island more reason not to. Because then they wouldn’t come to Bermuda. Every one of those boats leaves behind a lot of money in the form of supplies they buy, things they do, and what they pay when moored against a dock. And every one of those goods & services generates taxes paid to the Government. However that is a bit too complex for many to understand. This is why Bermudians who own yachts overseas should be permitted to bring them in, at minimal cost, each year. They would generate income for Bermuda that currently is spent overseas. What is worse, the money spent overseas on these boats & the travel going back & forth to these boats, is generated here in BD$. Again, way too complex for most, even Government, to understand. How about the issue of a National Debt available only to residents and other supporters of Bermuda at a nil or low interest rate for (say) 20 years? This could be used to repay some of the external debt and reduce some of the debt service cost. This was done by the UK and the US during the war years (War Bonds) and has (I think) been done by some countries hosting the Olympics in the past. Those who can afford it can make a patriotic contribution to our future by investing and if all goes well, they will be repaid down the line. Where else are you investing for an income anyway? I would certainly be up for it, but we need many more people. 20,000 people at $50,000 would be $100m which would at least be a start. A journey of a 1,000 miles begins with a single step….. Most of us have a hard time just making sure our families are taken care of… Do you think that we could raise any level of funding through purely local resources to even come close to making a meaningful dent in the debt burden. Our money comes from overseas, we have no significant local money production, in fact the only thing Bermudians export is money. @ Bermuda 123 – perhaps a typo but 20,000 people at $50,000 would be $1b, which would be a substantial benefit to Bermuda. Do you think there are 20,000 folks in Bda who have a spare $50K to invest in these bonds? I would be surprised if even 4,000 people had that free float. The mere prospect of the PLP returning to power makes this a non-starter. You want people to invest for 20 years with zero return? WW2 lasted 6 years. Patriotism is one thing but I am not putting up cash to pay for people who drive fancy cars to Eliza Doolittle for food. It seems as though the Chamber members put Min. Richards on the defensive about the private sector bearing Bermuda’s financial burden! Chambers members, especially the retail sector should be reminded of the significant subsidies they receive from government in the form of payroll tax concessions. The concessions applied to the smaller retailers but also included Miles, Gibbons Company, AS Coopers, MarketPlace etc, without any evidence of whether or not the stores are profitable and needed the concessions. Public Service salaries and benefits will have to be reduced to balance the government budget but we should not be too quick to point fingers. The hotel sector also benefitted from the public purse with hefty concessions under the Hotel Concessions Act. The Chamber could collectively help Bermuda if they helped to convince the banks to reduce their lending rates and for the Accountants, Lawyers, Doctors and other professionals to reduce their fees and thereby help to stimulate the local economy. First, the government does not subsidize the retail hospitality sector, a subsidy is a payout, they have to caring degrees of tax relief, the government is not pay out to them, they just aren’t collecting in from them. These consessions are helping keep many businesses afloat in these times and while there are a few who are profiting from it, your assupmtion that it is a boom for them is not quite accurate. For the most part, it has allowed these successful operators to invest more money back into upgrades to their businesses, i.e. more money to other business who do not benefit from tax breaks. To try and flex this concession policy for a few profiteers would create more operating costs in the form of continually having to audit businesses to find out if the are applicable, than would probably be worth for slight increase in tax revenues it would generate. The other note has to with Doctors rates, which isn’t actually set by the Doctors, but by the government and while I can not speak to about accountants and lawyers rates, other professional in the trades industries have their rates a points that are virtually cutting their own throats to get and maintain their businesses. The biggest point that was being made at this breakfast meeting was one that everyone there agreed on was that the government needs to reduce its payroll to a sustainable policy. The point of contention, particularly from the Chamber is that for going on a decade now, the pain has been levied on the private sector, when the only real solution has to be done in the public sector. I do agree with the Minister in his stance to avoid massive layoffs to achieve this, this will only burden the economy on a whole, while it would produce a reduction of expenses on the payroll, it would reduce tax revenues and increase demand on financial assistance and also reduce the amount of money going into the private sector through goods and services purchased. I recognize and that the Minister’s tax increases were nessecary and appreciate him minimalizing it as much as possible by spreading it around at a thinner level across multiple, but it will still put an increase of pressure on an already over burdened sector of the economy and we may see a few more businesses fold under the pressure. This leave only one real immediate solution for the short term, and that is the use of furlough days and reducing overtime usage and the rates down to regular time; and as was mentioned by those in the breakfast, that these policies should be levied toward the higher teir pay rates and not the low tier. The BTUC and its membership have to accept that in order for Bermuda to recover, rebuild and come back from this, they will have to bear more pressure and some pain, more so then they have thus far. Despite what they are trying to make us believe, their failure to accept this has lead to items like a capping on financial assistance and other social program cuts.